Bead Beautiful10% Off on Your First Order!! on Your First Jewelry Order!! Inspiration Story Jewelry is handcrafted motivational, inspirational jewelry designed and made from hand blown glass beads and stones gathered from all over the world. All beads, stones and colors are specifically chosen and arranged in a specific order to provide inspiration, meaning and healing. Most of the glass beads come from India, Czech Republic and Italy. Chokers are all single stranded and are 17" in length. Necklaces are all single stranded and are 24" in length. 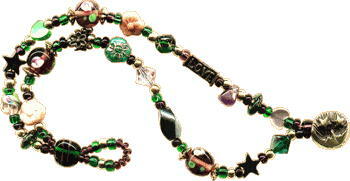 These "Beads of Grace" may be worn as a necklace (26" loop) or utilized as a "Rosary" or prayer beads.